This isn't what trunks were made for. 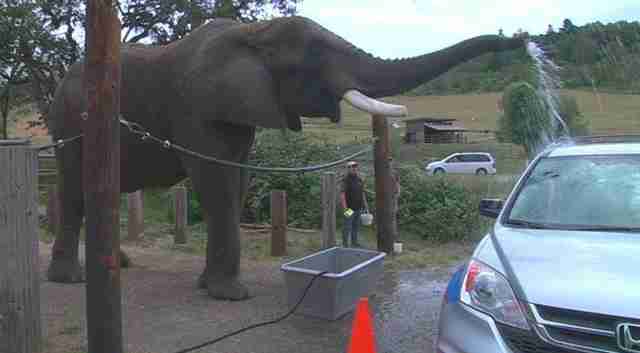 In a bizarre video, an elephant uses his trunk to slosh water onto the side of a car. "Awwww," a woman inside the car says. "Do it again! How cool is that?" There are also kids inside the car, and they laugh and squeal as the elephant dips his trunk back into a pink bucket and splashes more water onto the car. Then a zookeeper hands the elephant a sponge to start scrubbing a window. This is exactly what happens at Wildlife Safari, a zoo in Oregon. 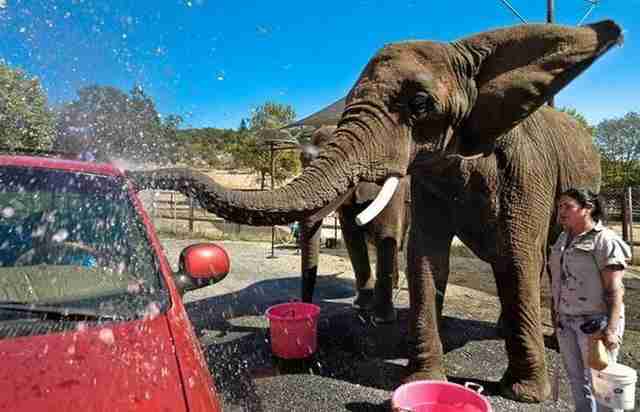 For $25, people can get an elephant to wash their car or truck, with the elephants using their trunks as hoses. While elephant car washes might seem like a neat thing, animal lovers argue the car washes are cruel, unnecessary and definitely unnatural. In fact, the zoo's car wash program prompted In Defense Of Animals (IDA), an international animal protection organization, to name Wildlife Safari as one of the 10 worst zoos in the United States. "It's particularly hard to see these magnificent wild animals exploited to perform such demeaning circus tricks, as we see at Wildlife Safari," Toni Frohoff, an elephant and cetacean scientist with IDA, told The Dodo. "These captive individuals are not being allowed to live the life they were born for." "Nature did not intend for [their trunks] to used as hoses for cleaning cars in living 'car washes,'" she added. Wildlife Safari also makes their elephants perform other tricks like "dancing," in addition to washing cars, and they also allow visitors to pet the elephants and take selfies with them. This past December, the zoo sold tickets to a "Christmas extravaganza" in the elephant barn, where guests could get an elephant to paint a wooden ornament for them. Yet Frohoff doesn't think elephants would be doing any of these things without the threat of bullhooks - long sticks with curved, sharp ends. While zoos often claim that the keepers only use bullhooks to guide and "train" elephants, the pointed end can break skin, and some keepers have been known to use bull hooks to beat and torture elephants. In a recent video on Wildlife Safari's Facebook page, a keeper appears to hold a bullhook under his arm as a visitor proposes to his girlfriend in front of the elephant enclosure, while onlookers snap photos. 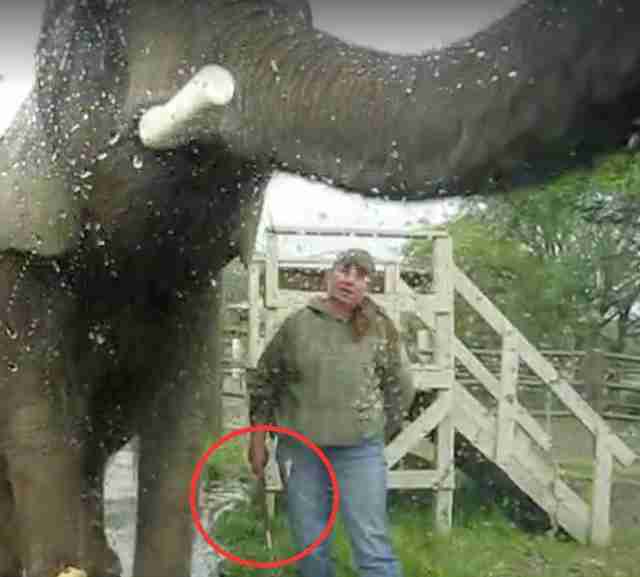 The keeper in the video of the elephant car wash also has a bullhook tucked under her arm. Frohoff calls the use of bullhooks "barbaric," and suggests that keepers use bullhooks to coerce the elephants to perform unnatural behaviors like washing cars. "The elephants ... are under the constant threat of the cruel bullhooks," Frohoff said. "Who would be happy in these conditions?" Besides being coerced to behave in unnatural ways, zoo elephants also live differently in captivity than they would in the wild. "In the wild, elephants roam over vast territories, but in zoos, they're forced to live in spaces measured in square feet rather than square miles," Katie Arth, media assistant manager for PETA, told The Dodo. "They crave living in close-knit family groups, but zoos hold them in artificially small social groupings - often with unrelated individuals and unnatural age groups - and deny them the option to avoid daily interactions with humans." While Wildlife Safari states on its website that it is dedicated to "conservation, education and research of native and exotic wildlife," Arth argued that the car washes do nothing to teach people about elephants, or to conserve the species. "In addition to the cruelty of captivity itself, these fundraising ploys send a dangerous message about conservation," Arth said. "Evidence shows that people who see endangered animals being petted or doing tricks no longer view them as being threatened, and these stunts may even encourage people to participate in cruel activities such as elephant rides." Frohoff is also concerned about the elephants' living arrangements. Wildlife Safari has five African elephants and one Asian elephant. Even though they're different species, the zoo houses the elephants all together. "[This reveals] disrespect and a lack of understanding for basic elephant social needs and the differences between elephant species," Frohoff said. "Elephants are among the most socially dependent and complex animals on earth. It is unnatural for them to be living with unrelated individuals, let alone in unnaturally confining conditions, particularly with members of other species. The lack of respect for elephant culture, communication and social needs ... is shocking." The car washes don't take place during the colder winter months, but a spokesperson for Wildlife Safari confirmed that they would be reopening this spring. 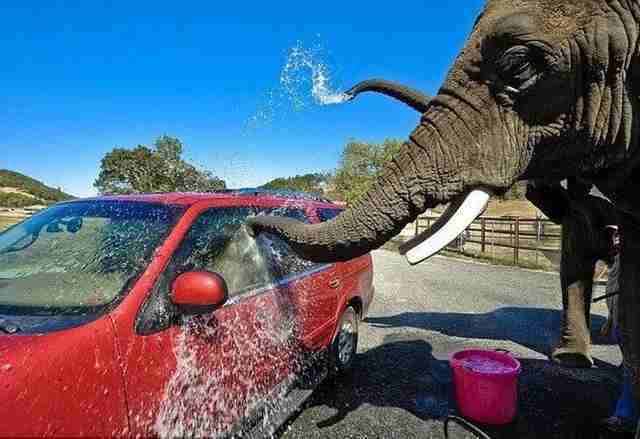 The elephant car wash program has been running at Wildlife Safari since 2009, according to Arth. Wildlife Safari did not respond to a request for comment. To help elephants rescued from circuses and zoos, you can donate to Performing Animal Welfare Society. You can also sign this petition, and help In Defense Of Animals continue to report on places like this by making a donation here.